I don’t have to state that the humble chicken egg is a staple when it comes to American food, because this is evident pretty much everywhere – every morning, food carts, delis and chains like McDonald’s or Dunkin’ Donuts offer variations of egg sandwiches that go from a simple bacon, egg and cheese on a roll or bagel to fancier concoctions that include grilled Canadian bacon, arugula or sun-dried tomatoes. The fact is that eggs are possibly one of the cheapest and most versatile of foods – I mean, what else can go in a sandwich, pasta, soup, a salad or a dessert? Sure, there are concerns about cholesterol or salmonella (if you choose to have them raw), but the fact is that you can go in any given direction with a product that costs very little and that is available pretty much everywhere unless you are looking for something more exotic like quail, duck or ostrich eggs (you can actually find the latter at The Greenmarket in New York’s Union Square). According to statistics by the American Egg Board, the average American consumed about 82 eggs in 2013, though it used to be far more – the number was three times as higher in 1984. Renata and I do not eat a lot of the stuff compared to most Americans – Renata is not a big fan of eggs for breakfast (this being one of the reasons we hardly ever go to brunches), and I usually eat cereal in the morning during the week. When I was a kid, I ate eggs almost every day because that is what American kids do. While in Brazil, eggs were a bit stigmatized because of their connection to poverty – many low-income families there top their lunches with a fried egg because they cannot afford meat or chicken on a daily basis, and I was often mocked for favoring egg-based dishes. At home these days , our home consumption averages about a dozen and a half per month between the two of us except when there is a dish that require more of them like the layered cold fish dish Renata makes for Christmas or Portuguese baked fish, which is generally topped by sliced hard-boiled eggs. That doesn’t mean that we completely abstain, though. There are many dishes I like to prepare from time to time, and sometimes on Saturday I’ll make a ham, cheese and egg sandwich on rye – something Renata and I got accustomed to having from time to time. Boil the potatoes until al dente. When cooled, shred and press in oven proof baking dish forming a crust in the bottom and sides. Put in preheated oven for about 10 min. In the meantime, mix all remaining ingredients. Pour egg mixture in potato crust and bake, uncovered, for about 30 minutes until set. 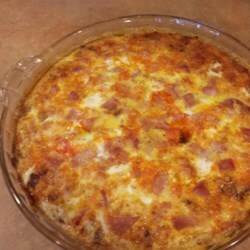 Remove from heat and allow quiche to rest for about five minutes before cutting. Eggs, gotta love them. When in food trouble (meaning when I haven’t eaten all day and I need something quick) eggs are always on the menu.